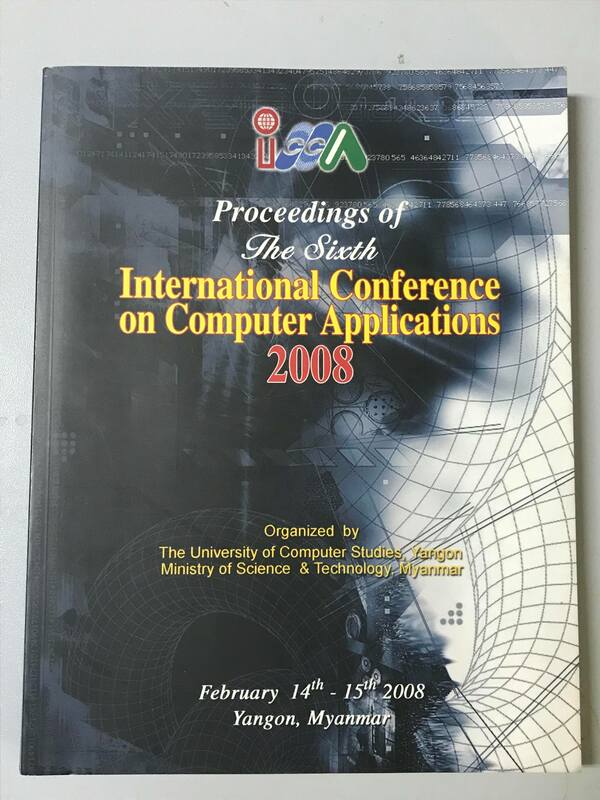 The Sixth International Conerence (ICCA2008),organized by Ministry of Science and Technology Myanmar, provides a forum for the presentation of technological advances and current research results in the fields of theoretical, experimental and applied computing and technologies. ICCA-2008, the fifth in the series that has been held annually since 2003, brought together leading engineers and scientists in computer and information technology from around the world. Prof. Dr. Jong Sou Park, Professor, Hankuk Aviation University, Korea. Prof. Soo-Hwan Chae, Professor, Hankuk Aviation University, Korea. Prof .Dr Jun Murai, Professor, Faculty of Environmental Information, KEIO University & General chair of WIDE Project, Japan. Prof. H.Jin Shozawa, Professor & Chairman, Board of Directors, ASIA Science and Education for Economic Development Institute, Japan. Prof. Daneial Tint Lwin, Associate Professor, Director, Centre for Continuing Education, Nanyang Technological University, Singapore. Prof. Dr. Tan Hee Beng Kuan, Associate Professor, Information Communication Institute of Singapore, School of Electrical and Electronic Engineering, Nanyang Technological University, Singapore. Conference Date: 14th -15th February 2008. Conference Place: Sedona Hotel, Yangon.